Back home, Atlas had a quarter acre garden and grew enough food on the plot to feed his whole family at harvest time. Gregory Warnock worked on the 39th floor of the north tower and met Atlas around the 18th floor as he was evacuating. “There was an older fireman (who)… gave me a smile. He was huffing and puffing, laughing to himself, making a joke about his age.” Warnock offered to help him carry his gear, and joined him for about 25 flights up. Atlas jokingly asked if Warnock was a firefighter. When told he was a broker trainee, Atlas advised, “you stay doing that, it’s better money.” People evacuating were saying others were trapped on the 72nd floor. Atlas told Warnock to “Go down, you did a great job.” He asked the firefighter’s name. “Gregg Atlas,” he said, memorably flexing to show the Atlas pose. 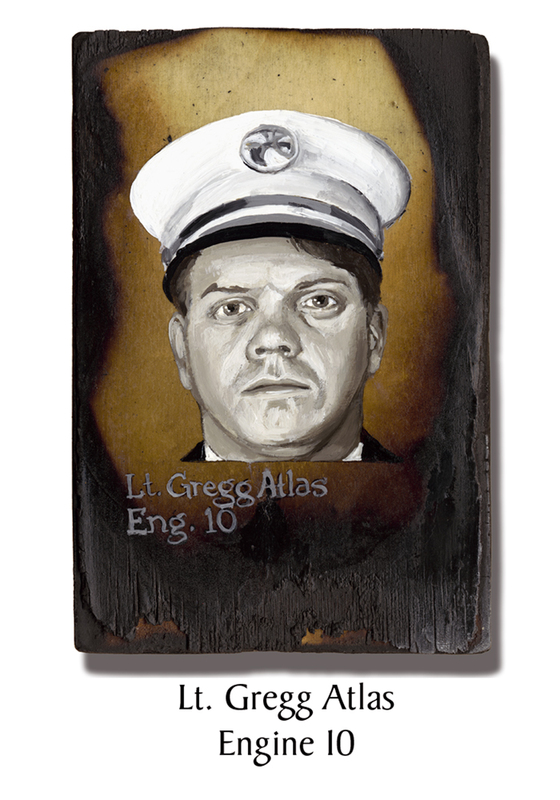 This entry was posted in Better Angels Stories, Uncategorized and tagged 343, 9/11, better angels, Dawn Siebel, FDNY, firefighter, firefighters, firefighters of 9/11, Gregg Atlas, LODD, NFFF, paintings, World Trade Center, WTC. Bookmark the permalink. This is a really special series.